Having trouble finding lightweight shoulder pads that provide you with the level of protection needed at a high impact position? The Riddell Power SPX Adult Football Shoulder Pad – LB/FB are exactly what you’re looking for! Recommended for linebackers and fullbacks these pads are built to give and receive big hits. Its slim design has short swim cut arches and swivel fronts to create an environment that moves in accordance with your body and maximizes shoulder maneuverability. 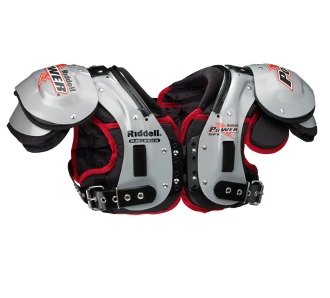 Riddell’s air management system allows the pads to breathe and keep you from overheating on the field. The STAC shoulder system, front deltoid pads and 1” BIOTHANE belt provide you with the durability and protection that is needed in order to play a high level at such a physical position!